Calling card of Susan Whittier. 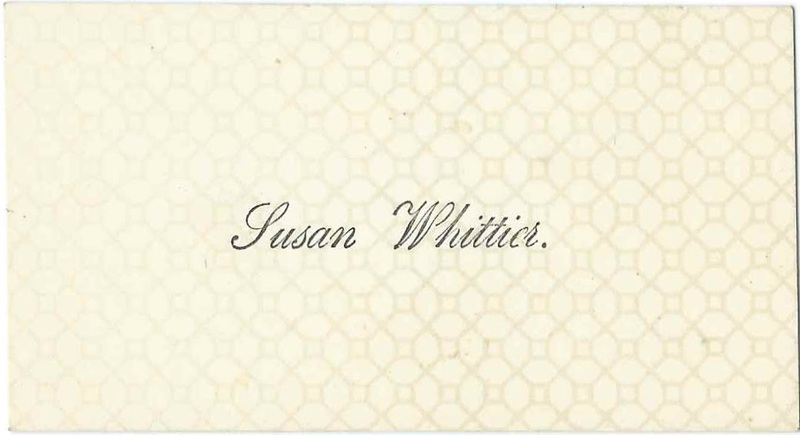 Because this card was found with a collection of others, many of them from New Sharon, Maine, there's a good possibility that this was the calling card of Susan Whittier, who was a teacher at New Sharon. Susan Whittier was born January 15, 1833 at New Sharon, Maine, the daughter of Levi Whittier and Mary Polly (Gordon) Whittier. It appears that Susan never married and spent her life as a teacher. In the 1880 Census of New Sharon, Maine, a Hattie F. Thompson, enumerated as Susan's daughter, was living in the household. I wonder if Hattie was Harriet Frances Thompson, "Hattie", daughter of Asa Heath Thompson and Abby G. (Hobbs) Thompson and perhaps adopted by Susan, or at least taken in by her, at some point after Abby's death in 1866. Hattie graduated with the second class of Farmington State Normal School, married Hugh Copeland and became the matron at the Maine Eye and Ear Infirmary at Portland, Maine, where her sister Mary was Assistant Matron. It was presumably this Susan Whittier who taught the Spring and Fall sessions at Belgrade, Maine, according to the School Supervisor's report for the school year 1884-1885 included in the Belgrade Annual Report of 1884/5. Very shortly after completing the Fall school session, Susan died, on February 21, 1885, and is buried with her parents and other relatives in the New Sharon Village Cemetery at New Sharon, Maine. Susan's probate file indicates that she was owed money from John Downs, the Smithfield, Maine, School Supervisor, so she may have undertaken a winter session at Smithfield, before passing away..